Forest ecologist Suzanne Simard and her colleagues at the University of British Columbia have made a major discovery: trees and plants really do communicate and interact with each other. They discovered an underground web of fungi connecting the trees and plants of an ecosystem. This symbiotic web enables the purposeful sharing of resources, that consequently help the entire ecosystem of trees and plants to flourish. Dr Simard was led to the discovery by the observation of webs of bright white and yellow fungal threads on the forest floor. Many of these fungi were mycorrhizal, meaning they have a beneficial, symbiotic relationship with a host plant, in this case tree roots. Microscopic experimentation revealed that the fungi actually move carbon, water and nutrients between trees, depending upon their needs. 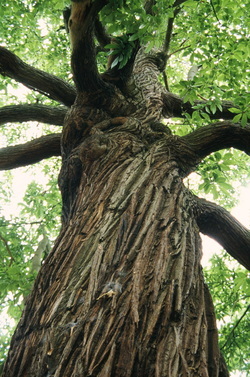 At the hub of a forest’s mycorrhizal network stand the “Mother Trees”— large, older trees that rise above the forest, as illustrated in the movie “Avatar.” These “Mother Trees” are connected to all the other trees in the forest by this network of fungal threads, and may manage the resources of the whole plant community. Dr Simard’s latest research reveals that when a Mother Tree is cut down, the survival rate of the younger members of the forest is substantially diminished. The concept of symbiotic plant communication has far-reaching implications in both the forestry and agricultural industries. This revelation may change the way we approach harvesting forests, by leaving the older trees intact to foster regrowth. In agriculture, undisturbed mycorrhiza systems enhance plants’ ability to resist pathogens, as well as absorb water and nutrients from the soil, bringing into question common practices that disturb these underground networks, such as plowing.